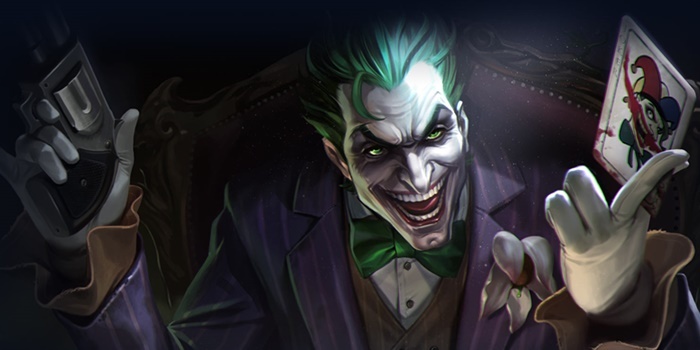 The Joker Item Builds Guide for Arena of Valor (AoV). Each build is geared toward a different play style, so choose one that fits your personal preference. Rankbreaker The Joker loves everything that Rankbreaker offers. Attack damage and armor pierce to boost his overall damage and out-of-combat movement speed allow him to dart between lanes and quickly pick off any enemies he comes across. Omni Arms Omni Arms provides a number of useful stats along with a passive that meshes beautifully with Punch Line. Using an ability before sniping an enemy with an empowered normal attack will effectively turn the 2.0 multiplier into a 3.0 attack multiplier. Fenrir’s Tooth Fenrir’s Tooth grants a huge amount of attack damage and a passive that will help The Joker finish off any low health enemy he finds. If you are ahead in money, it’s perfectly viable to pick up a second as the game goes on. Soulreaver The change to Soulreaver in patch 13 now allows The Joker to either jungle or simply head to the mid lane with Punish. Never a strong auto-attacker, The Joker has more use for the new Soulreaver because it gives him a straight damage increase – the second highest in the game behind Fenrir’s Tooth when fully stacked – and great CDR to constantly keep his abilities refreshed. Muramasa Muramasa is for when the enemy is stacking armor and Rankbreaker isn’t cutting it alone. Generally, we’d pick Spear of Longinus for pairing with Rankbreaker, as flat armor pierce stacks better, however The Joker isn’t great at applying the spear’s stacks to enemies. The Beast While not benefitting much from the life steal, the 100 attack damage that this item offers can be a fine way to pump up The Joker’s attack damage. The life steal will mainly be a way to farm up a bit of health in between ganks rather than a source of sustain in a team fight. Uriel’s Brand Uriel’s Brand is a bit situational, but provides enough attack damage to be on par with other attack boosts like The Beast and Claves Sancti. The 600 health it provides is a good way for The Joker to stick around skirmishes longer and the magic shield will help the clown prince survive whatever Pick a Card, Any Card does not block when escaping. Death Sickle Death Sickle keeps The Joker from succumbing to one lethal amount of damage every few minutes. We choose this over Ancestral Glory due to the stats that it provides. Pick a Card, Any Card helps The Joker survive after Death Sickle protects him rather than simply getting burst again while he runs away. Hermes’ Select Allowing him to zip between the lanes, Hermes’ Select is a wonderful item for The Joker. The additional speed will allow The Joker to be a lethal force all across the map and continually contribute to his team. Gilded Greaves Gilded Greaves is a great defensive choice for The Joker. The resistance that it offers will help him slip out of enemy crowd control whenever Pick a Card, Any Card is unavailable. War Boots War Boots can be a good choice for The Joker if your team lacks the ability to knock down towers. Despite playing more like an assassin than a marksman, The Joker may still need to help his team by pushing towers. The attack speed that War Boots offer will help him attack with more than the occasional Punch Line poke. This is going to be the most typical Joker build. The first four items are key: Rankbreaker, boots, Omni Arms, and Fenrir’s Tooth. Working together with Punch Line, The Joker will be able to dish out heavy amounts of damage extremely quickly. The remaining two items are more variable and should be chosen based on the game at hand. Muramasa counters enemy armor stacking and adds to the Joker’s considerable burst, while Death Sickle acts as a bit of insurance against enemy burst. This build takes a bit more time for The Joker to hit his full damage potential, playing a bit more cautiously and building up some defensive hybrid items. The Joker, as a marksman, will generally be high up on the enemy’s priority list and thereby can need a bit of extra survivability to get through their damage. Uriel’s Brand offers a nice little health boost and magic shield when the wearer’s health falls past 40%. The Soulreaver is not something advisable now it has less damage and the passive is just for melee champs. since new additional AS boost from utl. joker might be able to play crit on some level? He benefits more from it but I don’t think that critical chance will give him as much as more straight attack power. It is too small of a part of his kit to build around it.